Wedding Season is coming up quick. Before you say “I do”, however, a very important event will need to happen. The proposal. Guys, pop the question in style with custom proposal temporary tattoos from TattooFun.com. Your bride-to-be won’t be able to resist a proposal with our custom temporary tattoos involved. Flash mobs were the trends of the early 2010s for proposals. Temporary tattoos could be the next big trend in proposals. Imagine, your girlfriend walks into a bar or brewery for what she thinks is just a regular party. Imagine her surprise when everyone she sees is wearing the same custom proposal temporary tattoos. All of the temporary tattoos have something to do with your relationship, the proposal or marriage. Then, with all of her friends and family watching, you get down on one knee and pop the question. Before you get down on one knee, however, consider the following ideas for custom proposal temporary tattoos. You can never go wrong with the original question. Will you marry me? 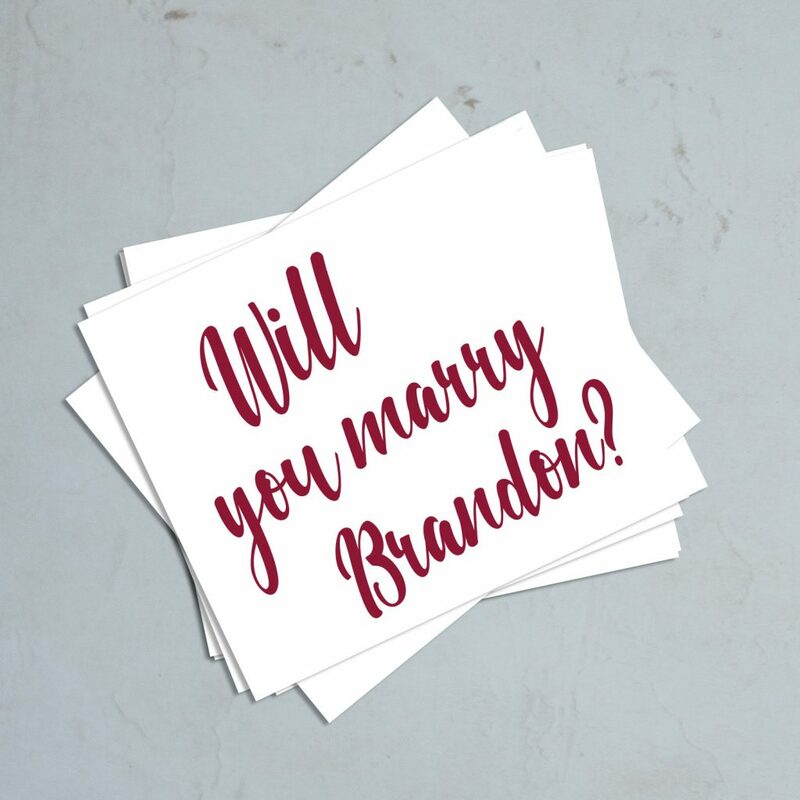 Design a custom temporary tattoo for all the guests of your proposal party to wear with this question. When your bride walks into the room she will see all of the custom proposal temporary tattoos. There will be no question in her mind as to what is about to happen. This is a proposal especially for her, and she will be so happy! 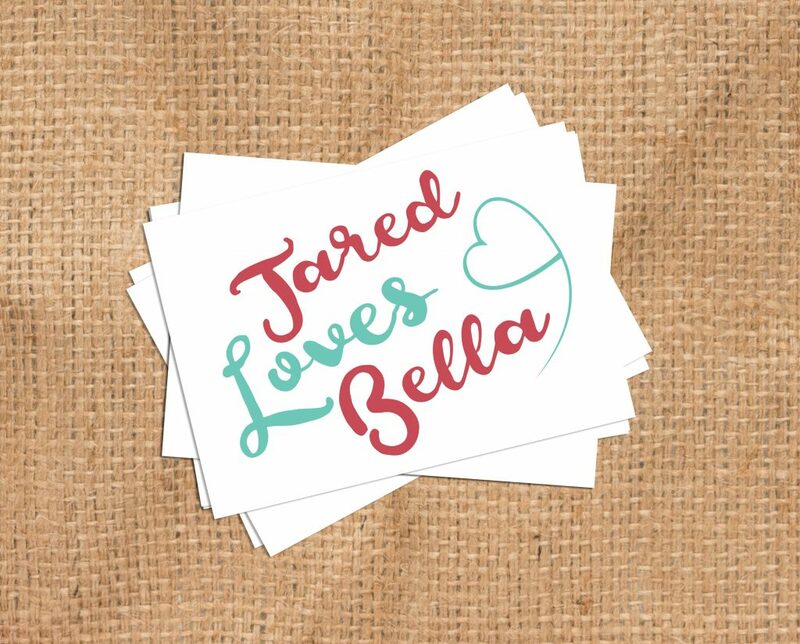 Why not put your name on the custom proposal temporary tattoo? Instead of “Will you marry me?” your tattoowill read, “Will you marry ___” (with your name in the gaps. Your tattoo can be 100% customized, so why not put your own name on it. After all, a wedding is just as much about the groom as it is the bride. So why not personalize your custom proposal tattoos to be a little bit about you as well? Your lives are going to be tied together for the rest of time after she says yes. So why not put the idea in her head through your custom proposal temporary tattoo? This temporary tattoo will be a keepsake for the rest of your lives. Not to mention you will have photographic proof for all of time of your name on your friends’ faces. 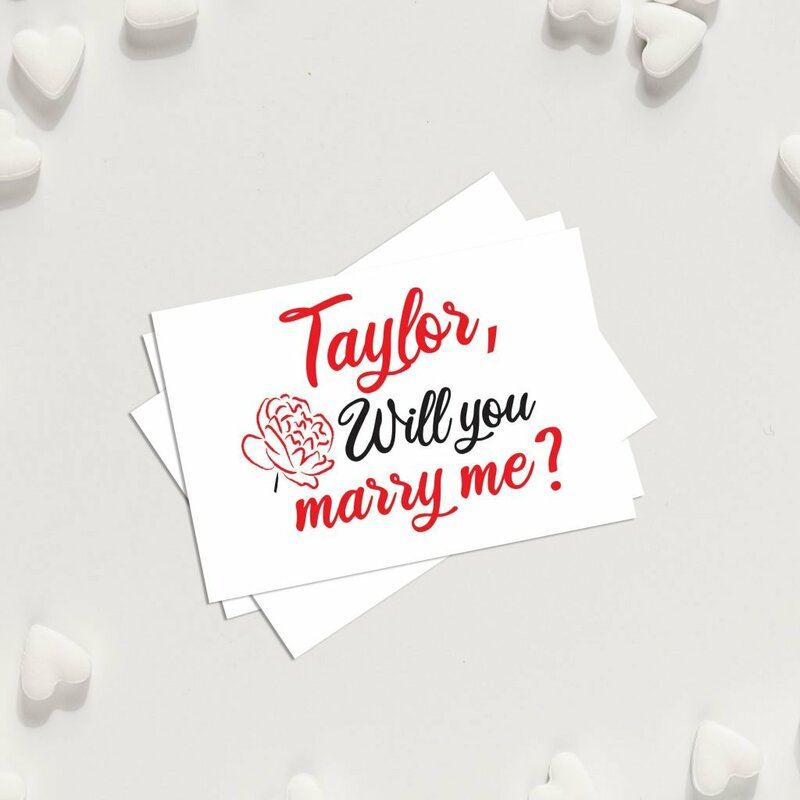 Your friends love you and will be happy to celebrate both you and your fiance by wearing these custom proposal tattoos. Your custom proposal tattoo can be whatever you want it to be. A fantastic idea for custom proposal temporary tattoos is to use a custom saying. 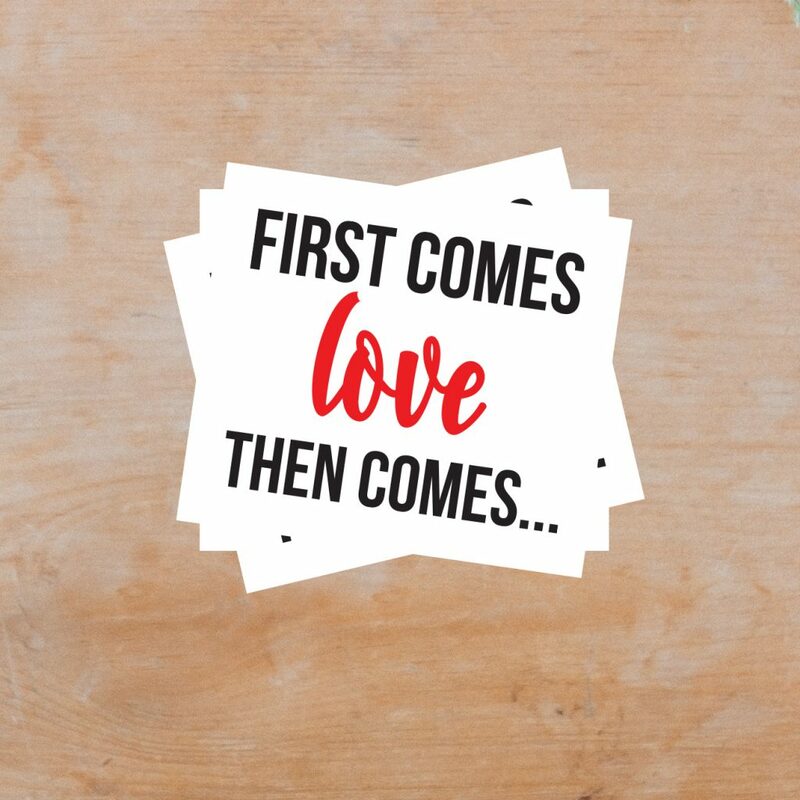 You can design a temporary tattoo with the saying “Happily ever after starts now” or “First comes love, then comes…”. This will make the temporary tattoos a hint as to what is to come at this party, without completely giving it away. Your proposal should be customized to both of your wants and needs. So make the proposal just as customized. Let us help you with a design! Whatever custom proposal temporary tattoos you decide on, remember that TattooFun.com will be able to help. If you don't know what temporary tattoo you would like to design, let us help you! Our team of graphic designers are happy to turn your vision into a reality. There may be a small design fee for their efforts. However, you can rest assured that we can bring your custom proposal temporary tattoos to life. All of our custom temporary tattoos are easy to apply, and only require a little water! Simply put the temporary tattoo against your skin and apply a damp cloth to the backing for 30 seconds. The best part of temporary tattoos is that they stay on for days. However, you can remove them anytime with rubbing alcohol or, even just a little hand sanitizer. (There is also special temporary tattoo remover available). We’ve been in the Temporary Tattoo business for over 20 years. Thus, we know a thing or two about what type of temporary tattoos people love. We ship millions of temporary tattoo sheets all over the globe each month. Additionally, we make all of our temporary tattoos in the good old USA. We also make all of our temporary tattoos with skin safe, FDA approved ingredients. We offer the best quality temporary tattoos, every day low prices, excellent customer service and guarantee your satisfaction!